^ 1.0 1.1 Announcement of Titles: Statement issued by the press secretary to The Queen. The Royal Household. 2011-04-29 [2012-04-30]. （原始内容存档于2011-04-30）. ^ No. 15429. The London Gazette. 1801-11-21. ^ Tim Ross. 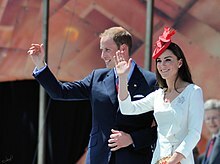 Could William and Kate be the next Duke and Duchess of Cambridge?. The Telegraph. telegraph.co.uk. 2010-11-16 [2012-02-11]. （原始内容存档于2010-11-21）. ^ Richard Eden. Royal wedding: Prince William asks the Queen not to make him a duke. The Telegraph (telegraph.co.uk). 2010-12-12 [2010-12-12]. （原始内容存档于2010-12-15）. ^ The Earl of Wessex-Styles and Titles. The Royal Household. [2012-04-30]. （原始内容存档于2016-03-03）. ^ No. 59798. The London Gazette. 2011-06-01.